Italian decision-makers were initially wary of providing vessels with onboard protection. Yet the persistence of pirate attacks eventually overcame this resistance. As a result, law 130/2011 established a dual approach to vessel protection, providing the owners of ships transiting through high-risk areas with the possibility to request the presence of a military Vessel Protection Detachment (VPD) on board. The VDP policy, however, was restricted to Italian-flagged vessels that adopted at least one of the shipping industry Best Management Practices and that were transiting through areas previously identified by the Ministry of Defence as piracy-ridden. It was later specified that the size of VPDs would range from six to nine uniformed personnel serving in the Italian Navy Infantry Fusiliers Brigade San Marco. The extra costs of their deployment in a protective mission abroad, amounting to 467 € per day per person, were to be carried by the ship owners. Consequently, the use of VPDs onboard Italian vessels challenged the public-private divide, allowing state military personnel funded by private capital to be embarked on commercial ships. Moreover, the dual approach envisaged in 2011 did not only introduce the use of VPDs but also allowed for the use of Private Security Companies (PSCs). Until last spring, however, the use of PSCs remained to a large degree a residual measure. Armed contractors could only be used if VPDs were not available, and ship owners asking for the authorization to embark armed contractors needed to include written proof that a previous request for VPD personnel had been rejected by the Italian Navy due to the unavailability of military teams during that period. Moreover, the use of PSCs was de facto impossible before October 2013 because of an incomplete legal framework, which still required additional provisions regulating the use, type, quantity and storage of weapons and clarifying the relationship between the security guards and the Ship Master. Owing to these limitations, between 2012 and the autumn of 2015 the large majority of vessel protective missions were conducted by the Italian military. Italian VPDs, consisting of teams of 6 to 9 personnel from the Italian Navy Infantry Fusiliers Brigade San Marco, conducted over 300 escorting missions, as opposed to the around 50 transits protected by PSCs. In March 2015, however, another major change was enacted. The Minister of Defence Pinotti announced before Parliament that the detachment of Italian Navy personnel onboard Italian-flagged vessels crossing pirate-ridden waters had been suspended. Consequently, the only option for armed protection available to Italian vessels transiting the Gulf of Aden now consists in the hiring of PSCs. As of June 2015, PSCs have already conducted between 120 and 150 escorting missions for Italian ships. Academic research has yet to fully unravel the drivers and implications of this policy change. While the minister explained the choice to refrain from using VPDs based on the decreased likelihood of piracy attacks and the full establishment of the norms allowing for a safe use of PSCs, other factors may have also played a role. The shifting priorities of the Italian Navy – now focused on humanitarian search and rescue operations in the Mediterranean – and the problematic implications of detaching military personnel onboard merchant vessels – epitomized by the ongoing detention of two Italian Navy personnel in India – may be especially important to fully explain the decision. As acknowledged by the Italian Senate Defence Committee, the use of private contractors may – due to their commercial nature – ‘reduce diplomatic complications in case of incidents’. 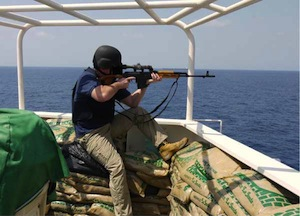 The effectiveness and appropriateness of using armed private security contractors both on land and at sea, however, have frequently been criticized by academics and journalists alike, and may result in an escalation in the use of force if international naval operations in the high-risk area will eventually be suspended. Hence, more research is needed as to whether and to what extent PSCs offer a viable solution to the problem of piracy attacks off Somalia. The article Contractors as a Second Best Option: The Italian Hybrid Approach to Maritime Security, co-authored with Stefano Ruzza, is only the starting point for future research on the rationale underlying different vessel protection strategies and their implications both in Italy and worldwide. Dr. Eugenio Cusumano is an Assistant Professor in International Relations at Leiden University in the Netherlands. His research focuses on the increasing privatization of both land and maritime security, its drivers and its strategic, legal, ethical and political implications. His work has been published on several academic journals such as International Relations, the Journal of Strategic Studies, Armed Forces & Society, International Peacekeeping and Ocean Development & International Law. Eugenio can be contacted at e.cusumano@hum.leidenuniv.nl. Cusumano, Eugenio and Ruzza, Stefano. 2015. Contractors as a Second Best Option: The Italian Hybrid Approach to Maritime Security. Ocean Development & International Law, 46:2, 111-122. Ronzitti, Natalino. 2012. “Law of the Sea and Immunity of State Officials Issues.” Italian Yearbook of International Law XXII:1–22. Ruzza, Stefano. 2013. “Keeping or Selling Stock?” In Commercialising Security in Europe: Political Consequences for Peace Operations, edited by Anna Leander, 181–201. London and New York: Routledge. Atteritano, Andrea. 2012. “Italy.” In Multilevel Regulation of Military and Security Contractors, edited by Mirko Sossai and Christine Bakker, 233–253. Oxford: Hart.